Day 1 (L,D): Ha Noi – Mai Chau – Son La (320kms / 8 hours) 8h00 Pick up at the hotel. Travel through the verdant Red River Delta and witness the day to daylylife of the peasant farmers. Stop in Mai Chau for a short walk then drive onto Son La – the capital of Son La province. Overnight in hotel. Day 2 (B,L,D): Son La – Tuan Giao – Muong Lay (220kms / 7 hours) Son La has an old French prison and museum, perfect for a small walk to visit in the morning before your departure. From here you’ll carry on to Tuan Giao, then onto Muong Lay (formerly Lai Chau) for the night. You’ll enjoy the picturesque scenery as you pass the villages of Black Thai, White Thai, Meo and Muong peoples. Day 3 (B,L,D): Muong Lay – Sin Ho – Lai Chau (200kms/7 hours) From Muong Lay, the drive to Sin Ho is stunning with tiered tea plantations and verdant rice terraces carved into the landscape. 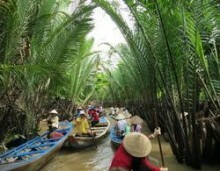 Excursion with private guide in Hanoi. Continue to Lai Chau (formerly Tam Duong) for the night. If you happen to be in Lai Chau on a Sunday morning, the town is bustling with activity as the local hill tribes gather for their weekly market day here. Overnight in a hotel or guesthouse. Day 4 (B,L,D): Lai Chau – Sa Pa (80kms / 3 hours) From Lai Chau to Sa Pa you pass through Tam Duong (formerly Binh Lu), up over the 1900 meter Tram Ton pass, considered the most beautiful stretch of road in Vietnam. Sa Pa is nestled at over 1600 meters in the Hoang Lien Son Mountains and the valley truly is breathtaking. Enjoy lunch and relax before a 3 hour short trek down this stunning valley, which is sculpted with steep rice terraces, to Ta Van village for a home stay. Your guide will cook you a savory dinner of traditional Vietnamese food that you’ll be raving about, as you enjoy the hospitality of your Dzay hosts. Day 5 (B-L-D): Sapa A good day trekking along rice terraces, through lush bamboo forest and local villages includes that of the colorful Dzao hill tribes, and down to a rolling stream for a picnic lunch. After lunch, continue trekking along the rice terraces, trails and dirt roads into Ban Ho for an insightful night with your Tay hosts, where you’ll sleep in the cozy loft complete with comfy mattress and a mosquito net.